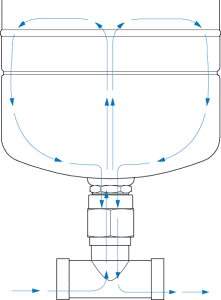 The FlowThru™ inline adaptor, compatible with GWS inline tanks with 1″ connection, is uniquely designed to ensure maximum recirculation of water stored in the tank while assuring low pressure drop in the main pipe. The fitting easily mates with the tank and pipe mounting. The insert redirects water through the pressure tank, eliminating the possibility of stagnant water during normal system operation. Featuring multiple orientations for installation, it eliminates the risk of leaking or overtightened connections.